As part of our infographics series on home improvement ideas through crafts, we want to introduce you to decoupage, or the art of applying cut up designs to the surface of anything you want to decorate. If you’ve moved recently or are planning to move, or if you’re just doing some spring cleaning, you may find an old piece of furniture that’s scuffed with peeling paint or just looks worn out. Or maybe it’s an old and boring table, lamp or even a jewelry box. 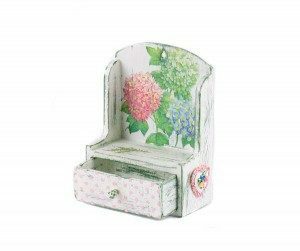 Well, decoupage is a great way to rejuvenate old furniture and give it a whole new artsy look. Since you get to pick the design, whether it’s an art print or poster, a flower garden or a vintage car, decoupage let’s you really personalize your things. And, it’s a lot of fun. Our infographic gives you the scoop on what you need to know and some of the choices you can make for your decoupage project.